If I may say so, this stir fry was absolutely fantastic! 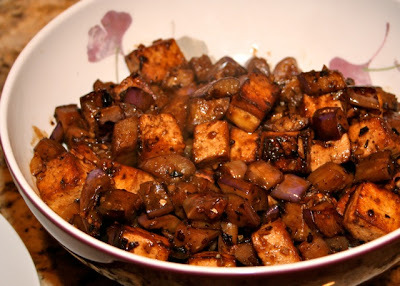 I love the slender Asian eggplant and it was perfect paired with tofu. 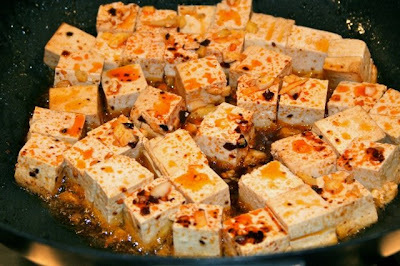 Here you can see my pan cubed tofu. I first threw in chopped garlic and ginger into the pan. 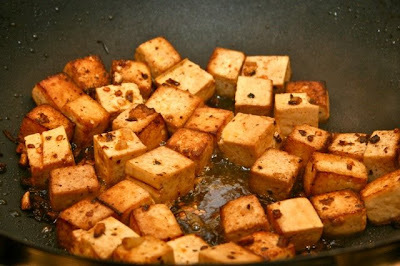 That was followed by the tofu which I seasoned with a little soy sauce and some of that wonderful chili flakes in oil. You can see what half a teaspoon of it does to color this dish. I stir fried the tofu on high heat until it was browned on all sides. 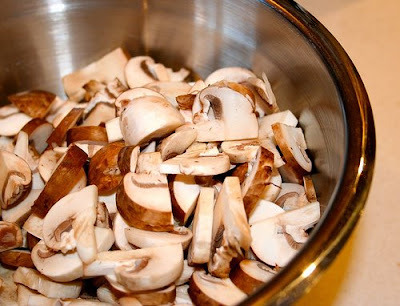 This was removed from the pan and set aside. 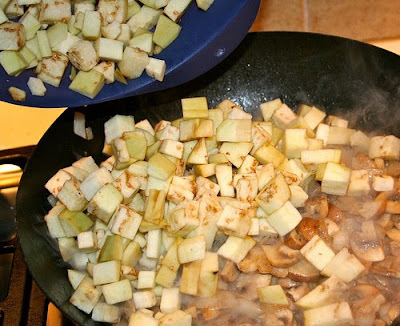 Into the pan, still with the flavored oil from frying the tofu, I added more chopped garlic and ginger, onions and that delicious Asian eggplant. 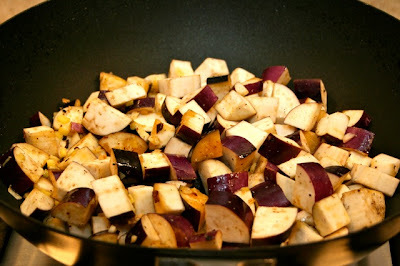 The eggplant was fried until it began to get tender. The tofu was added back to the dish and it was seasoned with some sesame oil and soy sauce. 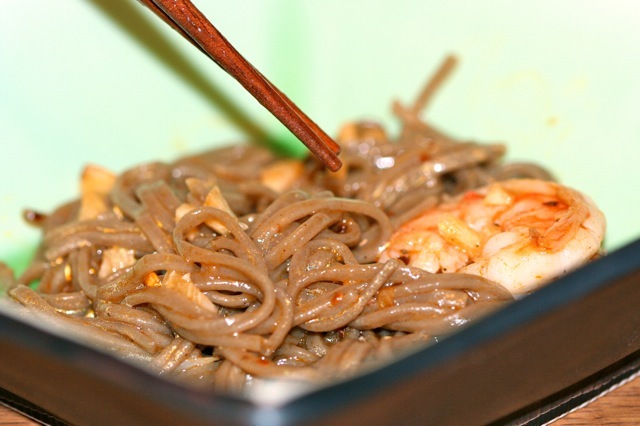 One last thing I added was a teaspoon of Szechuan black bean and garlic paste. Oh, what a flavor! I was pleased with how the sauce clung to the food and not the pan! I definitely have to make this again. 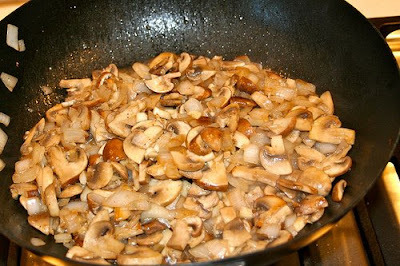 I know ragu is traditionally a meat-based sauce but I think these mushrooms are ‘meaty’ enough to consider this sauce a ragu. 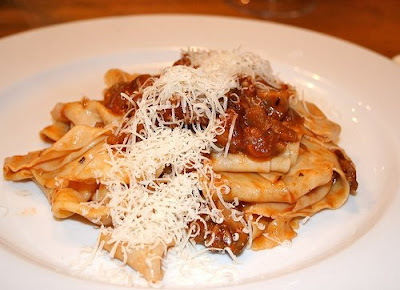 Combined with homemade semolina pappardelle, this was a home run hit for dinner. 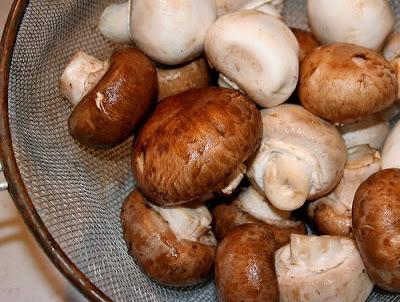 My sauce started with a combination of baby portobello and button mushrooms. 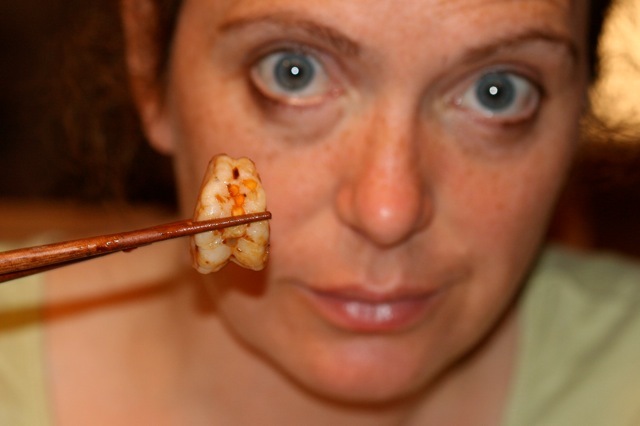 They were halved and sliced. 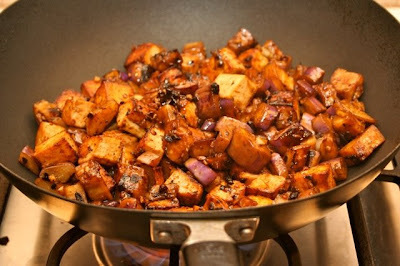 I also cubed up a whole eggplant for this dish. 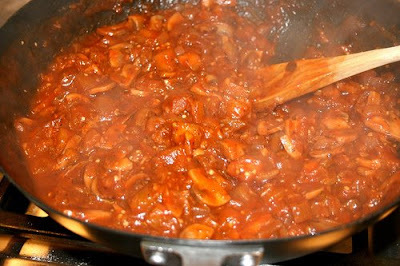 Of course you can’t have a pasta sauce without garlic and onions! 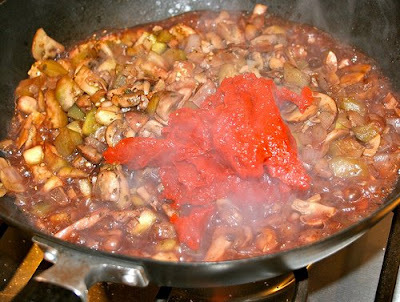 First the onions and the mushrooms were cooked down until softened and tender. Then the garlic was added to the pan. 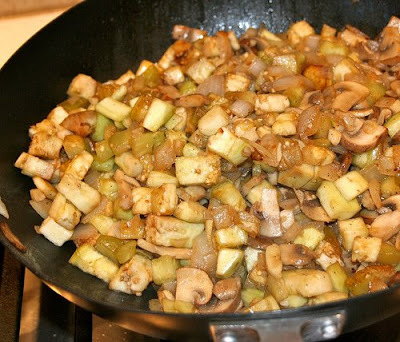 The eggplant was combined with the cooked onions and mushrooms. Everything was sautéed until the eggplant began to soften. 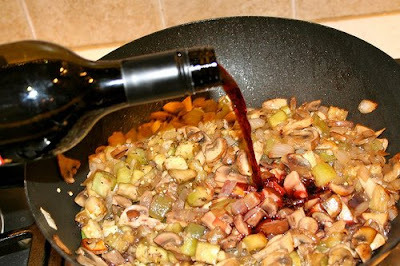 A bit of red wine was added to the pan. And a can of tomato paste was stirred into the sauce. 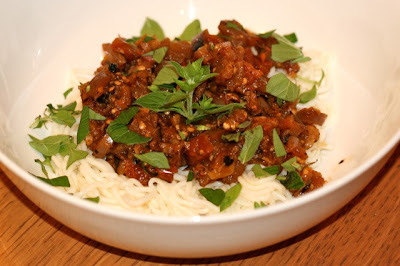 The ragu was covered and cooked down until the eggplant dissolved and the sauce was rich and delicious. A little water was added during the cooking to keep the sauce from getting to dry. 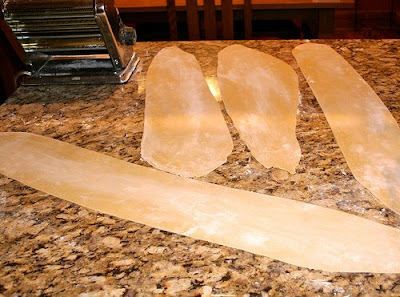 Meanwhile, a pasta dough made from all purpose flour, semolina flour and eggs was prepared and rolled out into sheets using my pasta roller. 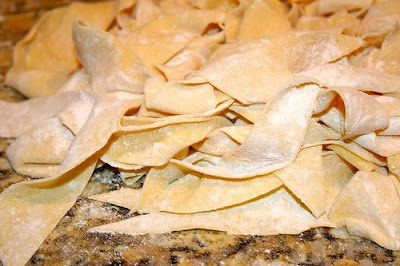 The pappardelle was cut by hand into wide noodles. 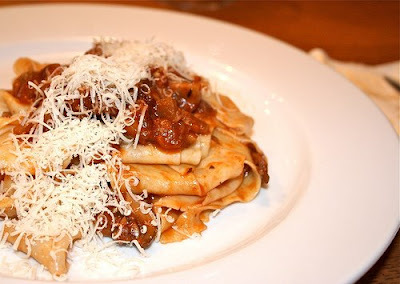 The noodles were boiled until al dente and tossed with the ragu. Finally I topped it off with some parmigiano reggiano. Lately I have been eating a lot of Asian inspired dishes. But on Monday I was in a mediterranean mood. I had these two eggplants and didn’t quite know what to do with them. I was thinking about the baked eggplant slices with tomato I have made before, but I wanted something a bit more substantial. I wanted a one-dish meal. I ended up with this chicken and eggplant dish. 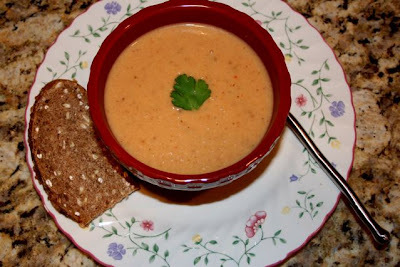 It was quite simple to make and it still is low fat and low in calories. 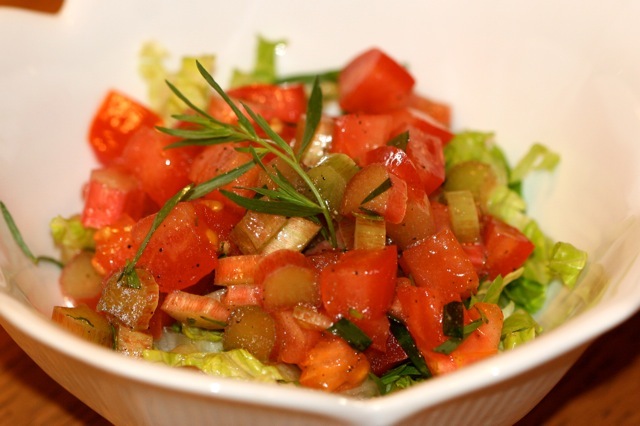 This HUGE dish of food split into six very generous portions packs less than 200 calories per serving. 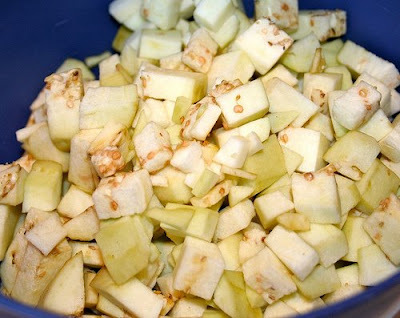 I cut up two eggplants into 1 inch cubs which resulted in about 6 cups of eggplant. I also cubed up 16 oz of boneless skinless chicken breast. 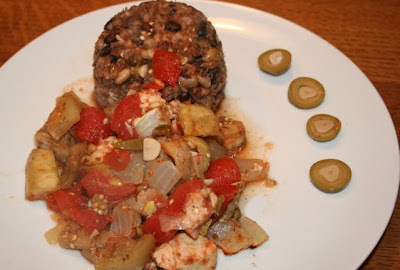 This was tossed together with 1 large onion, chopped, about a half cup of chopped garlic-stuffed green olives, 1 whole head of chopped garlic, 2 cans of diced tomatoes, a couple tablespoons of dried oregano, salt and pepper. 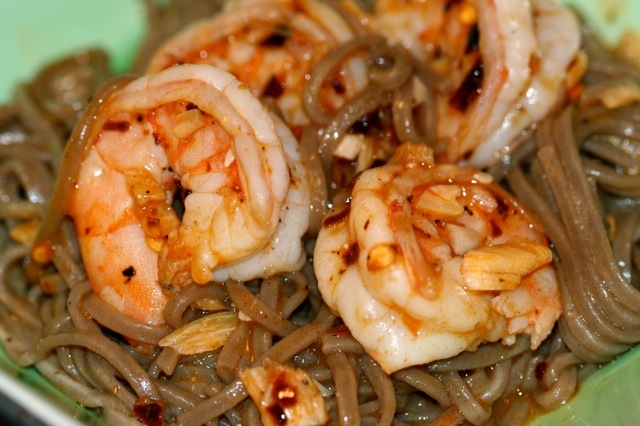 This was all placed in my large wide porcelain pan and drizzled with just a scant tablespoon of olive oil on the top. 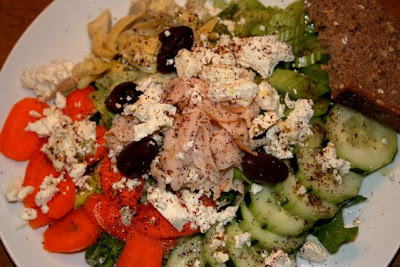 Now, normally I would have soaked the dish with olive oil but I’m trying to be light. 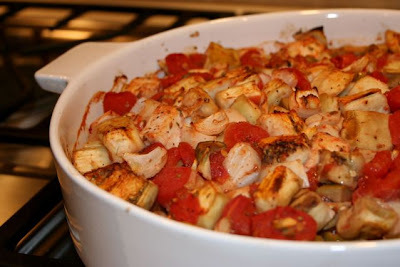 This was baked in a 400F oven until all the vegetables and chicken were cooked through, the juices were bubbling up, and the top was beginning to caramelize. This took about an hour. You can see I served it with some of my mixed beans and grains. 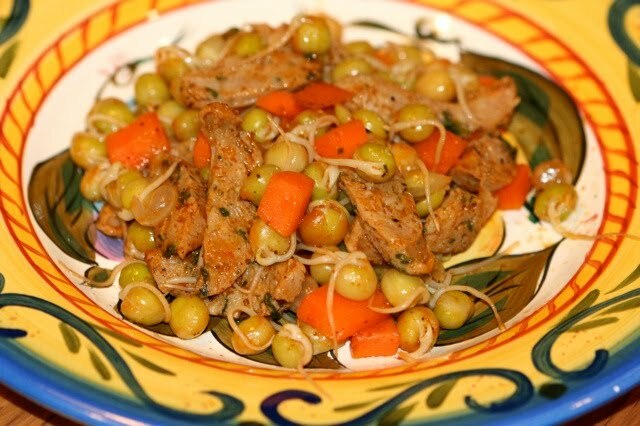 The garlic, olives and oregano really make this dish sing.